1. Raise the vehicle on a hoist. 2. Support the No. 1 crossmember with a jack stand. 3. Remove both wheel and tire assemblies. 6. 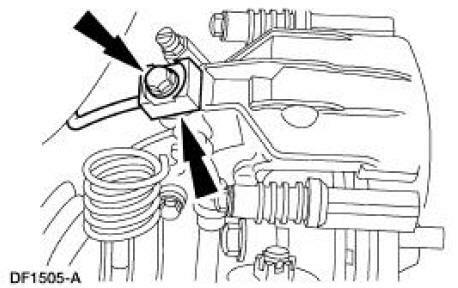 Disconnect the parking brake cable and conduits from the parking brake levers. 7. Remove the clip and disconnect the parking brake cable and conduits from the rear brake calipers. 8. Disconnect the parking brake cable and conduits from the knuckles (5A968/5A969). 9. Remove the bolts and the parking brake cable brackets. 10. Remove the bolts and the rear brake lines. 11. Remove the bolts and the ABS sensors. 12. Unclip the ABS sensor wires from the subframe. 13. Support the lower suspension arm and bushings (5A649) with jack stands. 14. Remove the nuts, bolts and disconnect the shock absorbers (18125) from the lower suspension arm and bushings. Discard the bolts and nuts. 15. Lower the lower suspension arm and bushings and remove the jack stands. 16. Support the rear subframe using the special tool 014-00765. 17. Remove and discard the nuts from the subframe front bolts. 18. Remove and discard the subframe rear bolts. 19. Remove the springs (5560). 1. Carefully lower the subframe with the special tool 014-00765, allowing the subframe to pivot on the front bolts. 2. Remove the springs and the spring insulators (5536).